Watching and reading about the latest innovations from EasyCare Inc. is always exciting and the release of the final product full of eager anticipation. Now that the EasyShoe Flex is here I find more options available to me as a hoof care provider than I know what to do with! The Flex comes in open heel or with frog support, with a metal plate or without, with quarter clips or toe clip, and can be glued, nailed, or both. So how do you decide? The only way we knew how to figure it out was to try them and be creative with their use! My friend and colleague, farrier Dan Schroeder, direct nailed the Flex (on the right in photo collage below). He’s had a lot of success improving soundness in horses with this type of application. 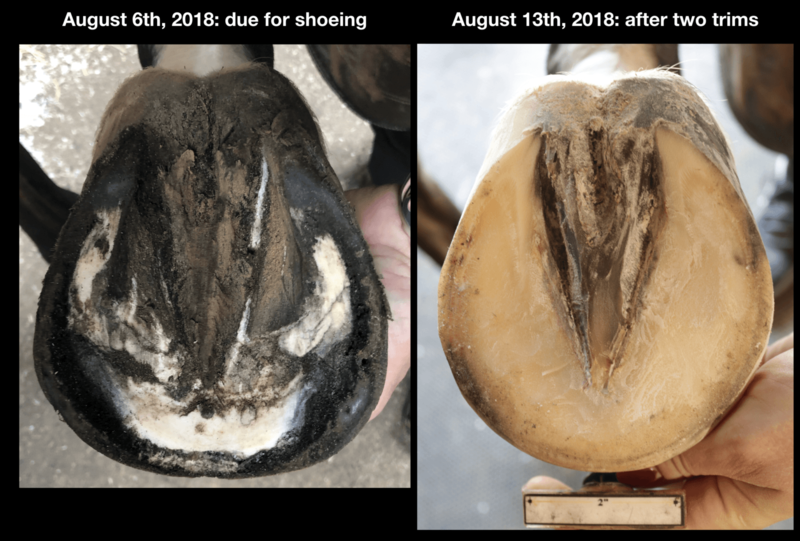 I gravitate to glue of some kind, although my teammate Heather Colket did an application with glue and nails (on the left on the photo below) and found this was also beneficial to the horse. 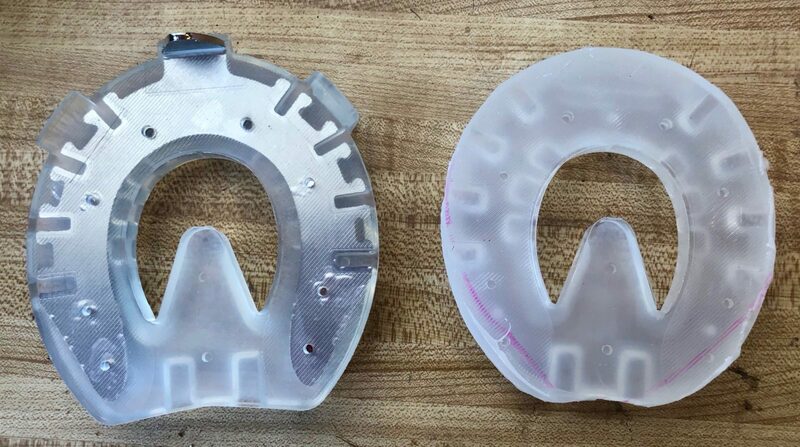 I found most of my personal applications utilize the heart bar versions with glue, dental impression material, and hoof casting. We played with the Flex Light, which has no steel spring core. For others when more stability was needed, we used the Flex Heart Bar, which has a spring steel metal plate from heel to heel. All were easy to apply and achieve the goals we were aiming for, and the horses maintained or improved their soundness. Here’s an example of one of my favorite methods of application. 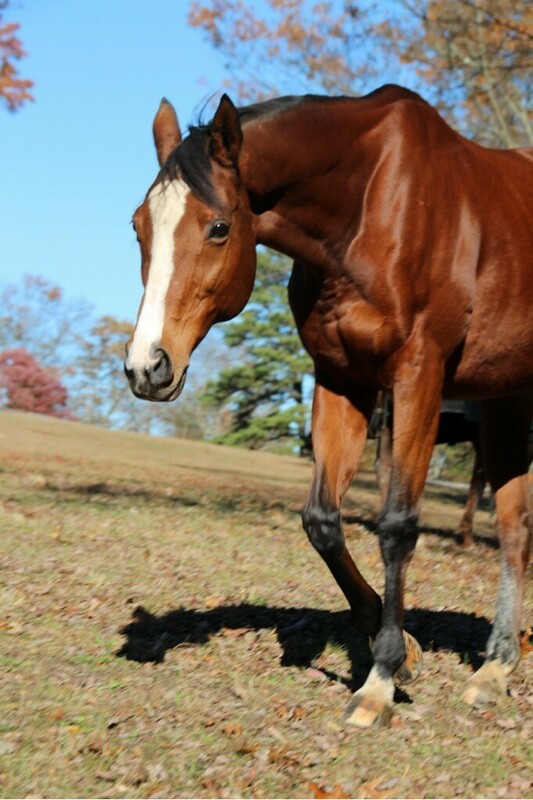 Mollie Rose is a 18-year-old thoroughbred mare with chronic arthritis. Both front fetlocks have arthritis however the right front is more significant for lameness than the left. When I met Mollie Rose in August this year I was asked if I could help her be more comfortable, if not sound. It was difficult to evaluate the previous farrier’s work because she was due to be re-set and therefore her foot was long. One of the biggest challenges impacting the soundness of horses with this mare’s problems is leverage on the arthritic joint and surrounding soft tissue. So assessment at the end of the trim/shoeing cycle should be evaluated with caution. The feedback from her owner was that she often galloped around the field but was not sound, and could not be ridden at her current comfort level even though she had been in the past. Despite the farrier’s best efforts the horse’s comfort level had declined and the owner wanted to try something different. Here is her right front foot when I met her, with the radiograph taken at the time of that shoeing. This style of shoeing, a banana shoe, where the ground surface and the foot surface are both curved with no flat surface, can greatly benefit horses with a variety of problems. 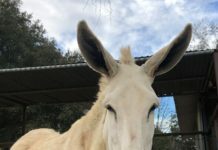 Put simply, the idea is that the horse can select the balance and alignment that is most comfortable to them, especially when arthritic conditions leave us somewhat guessing as to what balance change would most benefit the horse. 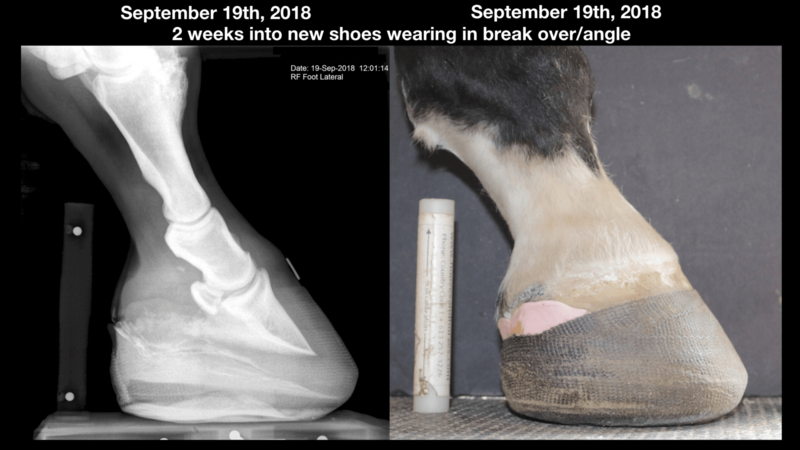 You can see this mare, Mollie Rose, chose to rock up onto the front part of the shoe, thereby functionally giving herself a more upright alignment to her foot and distal limb. 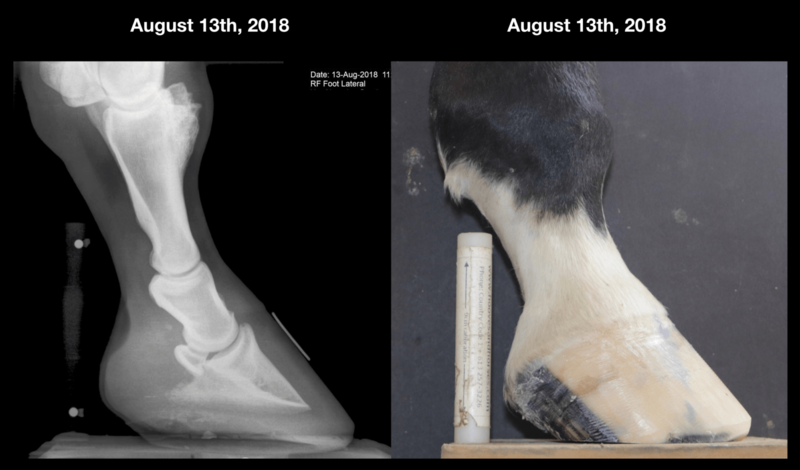 My hypothesis was that this horse would benefit from a shorter trim cycle thereby reducing leverage on her joints and length of her foot over time, easing the wear and tear on the joint and surrounding soft tissue. 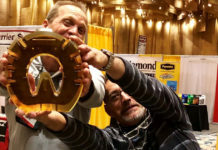 (See my blog PHCP Conference 2016: Packed Full of Gold, where Dr. Hillary Clayton discusses leverage on joints and soft tissue). I also wondered if she would like additional caudal support with a heart bar shoe and impression material as well as a change of material to something softer – composites! After removing her shoes, I trimmed her and applied Easyboot Clouds for cushion, protection and the mechanical advantage of the internal foam pad being a heel wedge. I knew that even with the boots and wedged Cloud Pad, I could not create the maximum leverage reduction this horse needed for long term comfort. 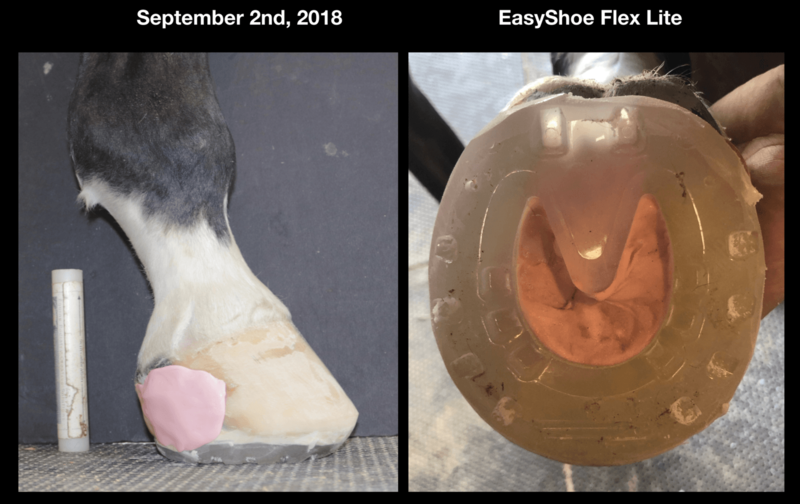 By adding the EasyShoe Flex Light, I was not only able to achieve the additional heel support I felt would help her, but also allow her to wear the shoe and hoof casting into even more wedge and leverage reduction over time as she grew. I chose the EasyShoe Flex Light because I could really push the modifications she might need. Here you can see where I really brought the circumference of the shoe in, and while I could make these modifications in the Flex Heartbar pictured on the left, I also thought she’d benefit from the lighter shoe without the metal plate. I also modified the ground surface further with my cordless grinder before applying hoof casting. I prepared the foot by first applying a trim to get as close to my hoof guidelines as possible. 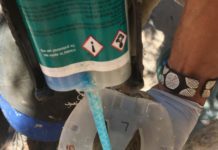 I also cleaned and dried the foot, applying antimicrobial topicals like Fungidye in the quarters, and Artimud around the frog and bars. 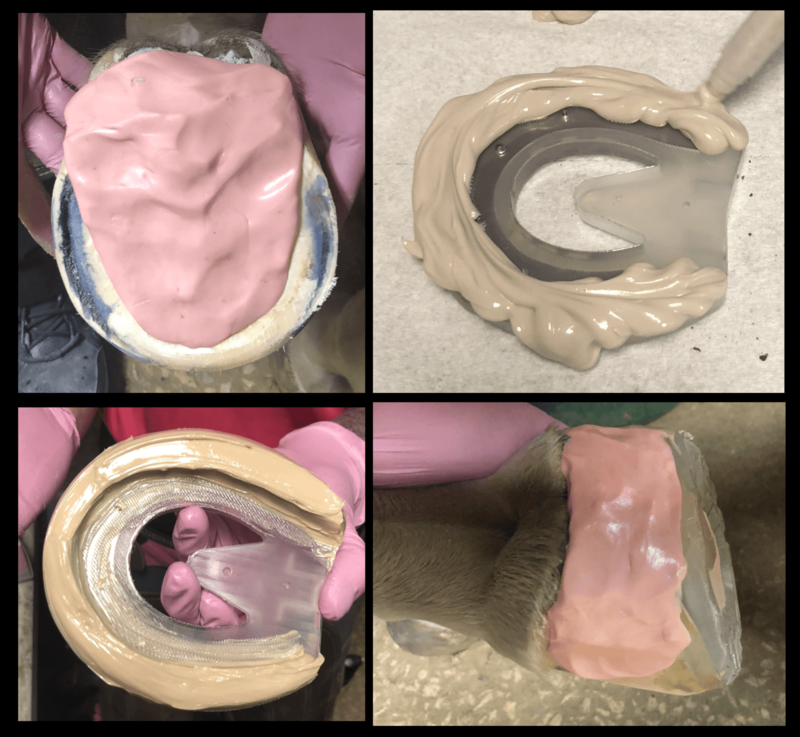 Then I applied the shoe and packing, using soft dental impression material to cover the contracted heels and build a slight wedge to prevent further contracture. I followed up with acrylic glue, and by pressing down in the toe created a bit of heel wedge with the glue. 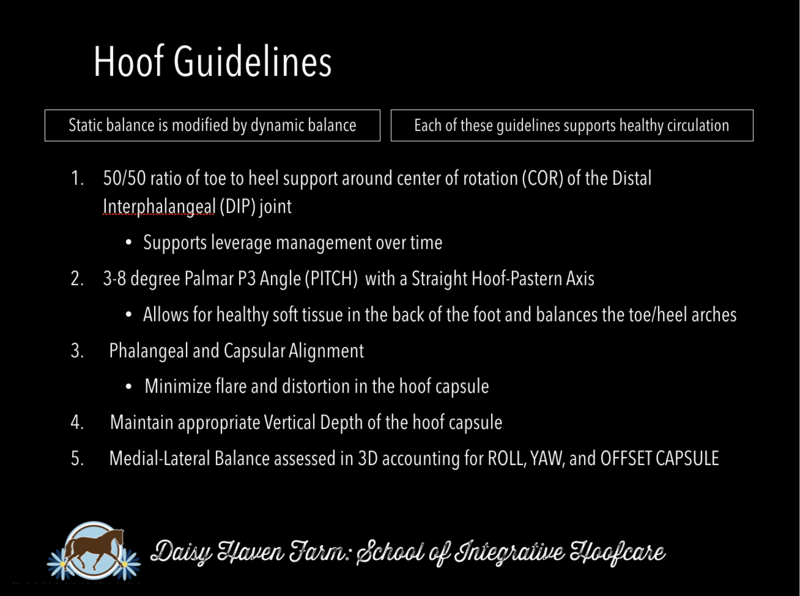 This further addresses leverage issues and gets me closer to those hoof guidelines above. Finally I added additional impression material at the heels to protect them from the casting. It’s very interesting to observe how Mollie Rose is adapting to her new shoes, only 2 weeks post-shoeing. 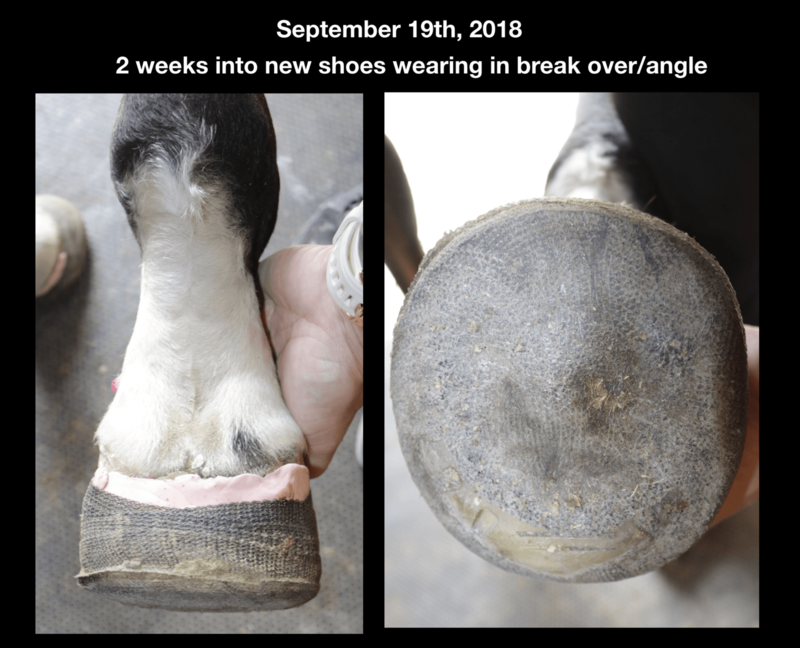 She has worn the composite materials, hoof cast, Flex Light shoe, and acrylic glue at the toe, creating more wedge and wearing the break over even further back. Her comfort level has greatly improved even though it’s been a very short period of time. 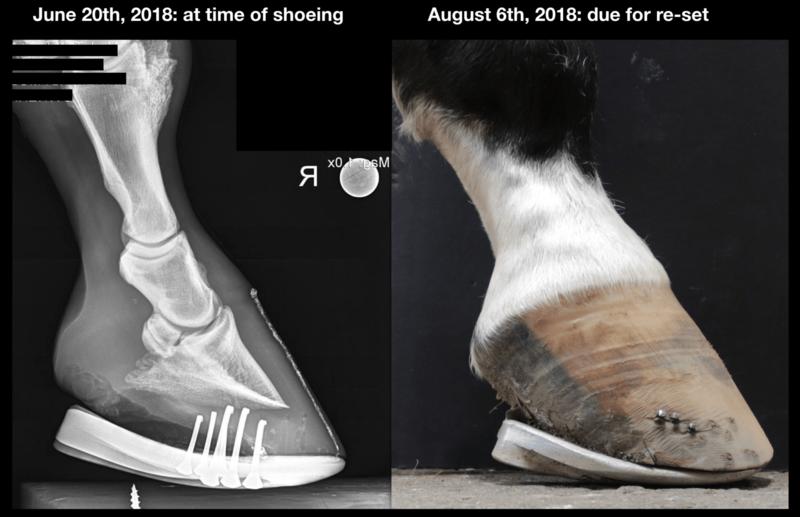 When we compare the radiographs for hoof balance from the banana shoe, to barefoot, to new EasyShoe Flex, there are interesting changes. Why is Mollie Rose so much more comfortable in her new shoes? Certainly the alignment and angles are very similar between the old shoe and new shoe. Could it be a subtle aspect of balance? Maybe a shorter trim/shoeing cycle? Maybe the change of material? Horses are such complex creatures, I’m just grateful I have the EasyShoe Flex as an option to create dynamic mechanics to help a horse like this one! 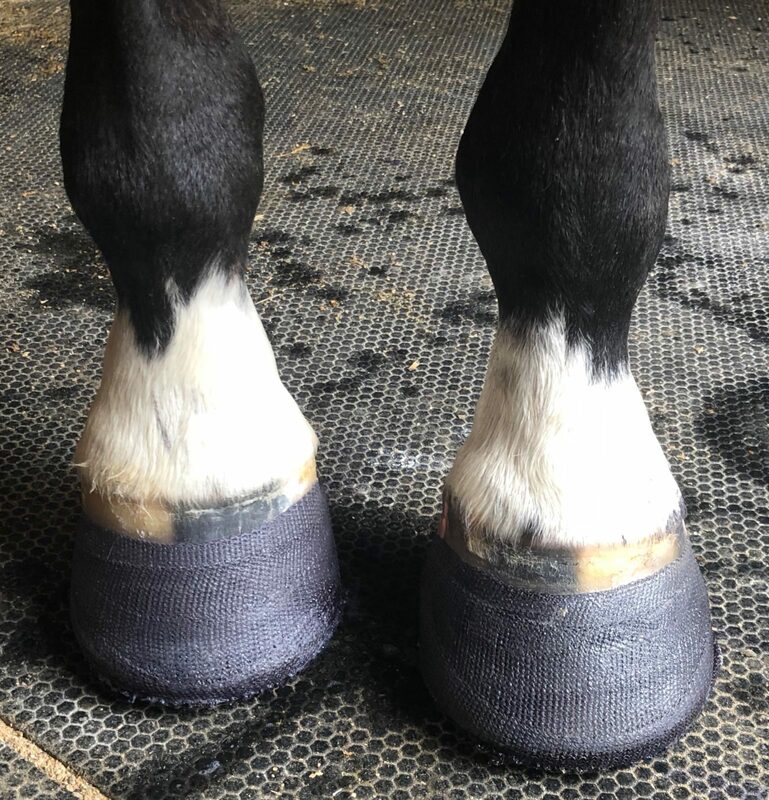 For more information about Daisy and help with glueing composite shoes like the EasyShoe Flex, please see www.IntegrativeHoofSchool.com for a schedule of upcoming hands-on workshops!